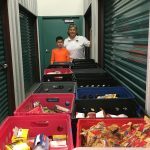 Young man delivers collected items to K.I.S.S. Cub Scouts – thanks for the candy! !